Rachel Jellinek is a partner at Reflection Films. Located just outside of Boston, Reflection Films is a video production company with experience in marketing, fundraising and training videos. Reflection Film clients choose video to share success stories, distinguish themselves from competitors, increase brand awareness in their target market and communicate in a more personal way with their audiences. B-roll is the extra footage captured to enrich the story you’re telling and to have greater flexibility when editing. Instead of featuring only talking heads on video, you want to have other images you can cut away to that will add dimension to your story. B-roll can include additional video footage, still photographs, animation or other graphic elements. Depending on the type of video you are creating, evenly divide filming between recording interviews and capturing b-roll. In our experience, having plenty of good b-roll makes a video more powerful. Because the times for capturing b-roll are often fixed (a certain activity only happens at a certain time), start by identifying the must-have footage and inserting that into your filming schedule. Fill in the rest of the schedule with interviews and nice-to-have b-roll. If you discover, due to limited timing, that you need to sacrifice either a must-have piece of b-roll or a nice-to-have interview, we often recommend sacrificing the interview. The value of b-roll should not be underestimated, not only because it can strengthen the impact of your current video project, but also because it can serve as key footage for additional video assets created down the road. Get an inside look at the value of b-roll in this video by Rachel Jellinek. Rachel presents two alternatives of a single video–one with b-roll and the second without: http://dlvr.it/lCKjN. A video camera. This is pretty obvious, of course, but which one? There are thousands from which to choose that will be perfectly adequate for the DIY producer. Even something as modest as the video recorder on a smartphone will work. We usually suggest, however, that something a notch above is preferable. Kodak’s Playtouch video camera, for example, is a low-priced option (about $175) that shoots decent video, and, just as importantly, has an input for an external microphone. Microphone. Using an external microphone should be a priority. Lousy audio is the easiest way to lose the audience for your video. We usually tell folks to go to Radio Shack and get a basic lavalier microphone that will clip on to a shirt. Plug that into your Playtouch and you’re good to go. Headphones. Headphones are not a must-have but definitely worthwhile. If you have a simple camera in which the head phones share the same input jack with the external microphone, headphones won’t be an option. But if your camera has two separate jacks‑one for the mic and one for headphones–you should be listening to your audio as it’s being recorded (imagine your dismay if you spent a day filming only to discover afterwards that your audio wasn’t recorded properly!). Ear buds are fine. If you have only one audio jack, use it for your mic, but just run a test periodically by recording a bit of video and playing it back (using headphones) to make sure it sounds good. Tripod. Nothing fancy is needed here. Most self-producers won’t be doing any crazy camera moves, so a basic tripod used for still photography is fine. Soft light. For the slightly more ambitious, having a soft light is a nice addition. Self-produced videos usually rely on existing lighting, most often fluorescent ceiling lights if you’re shooting in an office setting. Nearly all fluorescent lights cast a greenish hue. What’s more, lighting the top of someone’s head is rarely an attractive option. A soft light, such as a Diva-Lite by Kino Flo or a Lowel Rifa Light, allows you to illuminate your subject without much hassle and in a more flattering way. If you don’t want to bother with lighting equipment, use daylight from a window as your light source. Having something reflective like a piece of white foam core to place opposite the window and bounce light to the other side of their face is also helpful. A video producer explores the limits of DIY and the absolute importance of b-roll. I never argue that all video must be professionally made. In many cases, creating your own video is in fact the best approach. But all of us also know that self-produced business videos can look … well, self-produced. Frequently they suffer from some combination of poor audio, awkward camera angles, unflattering lighting or odd settings (interviewees in cluttered offices or against a blank wall). Many of these problems, however, can be easily avoided. So as you consider embarking upon a video project, you need to consider two things. First, should your video have a professional look or will a well-made, do-it-yourself video suffice? And second, if you are leaning towards the DIY approach, do you have the capabilities to do it well? Think clearly about your market. What are your clients’ or prospective clients’ expectations in terms of their viewing experience? What do they associate with you and your brand? Will you be able to deliver video that fulfills those expectations? Is your goal to share information (as in a webinar) or is your purpose to create something more promotional in nature? If you’re trying to share information, self-producing might be a good option as long as you are able to capture audio well. Also, if your video will have a limited shelf life and limited audience, then self-producing is probably your better bet. On the other hand, if you are interested in producing a promotional video about your company that will include multiple interviews, locations and a more complex storyline, then a professional can help you capture just the right brand experience for your audience. Be honest about your capability and comfort level. Many people think that if they have the equipment and staff to capture the footage in production, they’re all set. But a good video also depends on a solid messaging strategy in pre-production and expert storytelling in post-production. Ask yourself: Do you have the comfort level to prepare for and conduct client interviews? If you are seeking client testimonials or case study material, will you be able to get the filming done properly the first time? If not, are you at risk of having to go back to your clients another time (or is that not even an option)? Self-producers have a tendency to capture a lot of material and throw it up on their websites, without paying much attention to honing their message. Once you have all the footage recorded, will you be able to edit it to be compelling and concise? Think of where your money and time are best invested. Should your staff be spending the time to learn how to create video effectively or would their time be better spent on some other business-generating activity? If you can’t decide, do both. Creating video professionally or on one’s own doesn’t have to be an either-or scenario. 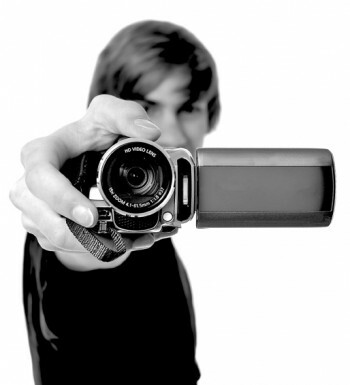 If you decide to film on your own, you may want to engage a professional to guide you on how to get the best outcome. I’ve seen a hybrid approach work well: A client brings us to record activities and interviews at a special, one-time event such as an annual meeting. (You don’t get a do-over for a one-time event.) Then the client shoots b-roll (see sidebar p.15) or supplemental footage independently. Finally, they bring us in to edit the collection of videos and various clips for a website and for a social media plan. There is plenty of room for a collaborative approach with your producer throughout the production process. If you do decide to hire professional help, be sure to explain to your producer the look and feel you want. Do you want a news-style, man-on-the-street approach or a staged production? We often ask our clients to share examples of videos that they like and dislike to understand what they hope to achieve.